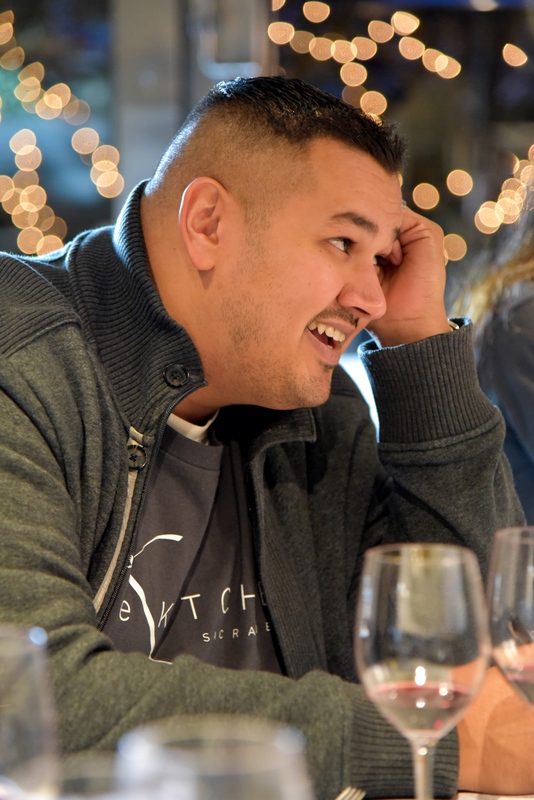 At The Kitchen, we’re lucky to have a team that is knowledgeable and passionate about food, beverage, and hospitality. Though our staff is small, they pack a big punch, and that includes our servers and sommeliers. Of the six or so “front of house” staff who serve nightly, nearly all have attained some level of wine certification from the Court of Master Sommeliers, and all attend weekly wine tastings and monthly menu and wine pairing tastings in order to help provide the highest level of service and the most knowledgeable and expert beverage recommendations for your dining experience. Our two official Sommeliers, Sommelier Tesh Diyal and Assistant Sommelier Diego Garcia, have both attained their Level 2 “Somm” Certification. This is a difficult feat that requires many hours of preparation. And our remaining staff – Wine Steward Shawn Conway, GM Eric Philbin, and servers Veronica, Jeramy and James have all attained their first level certifications. 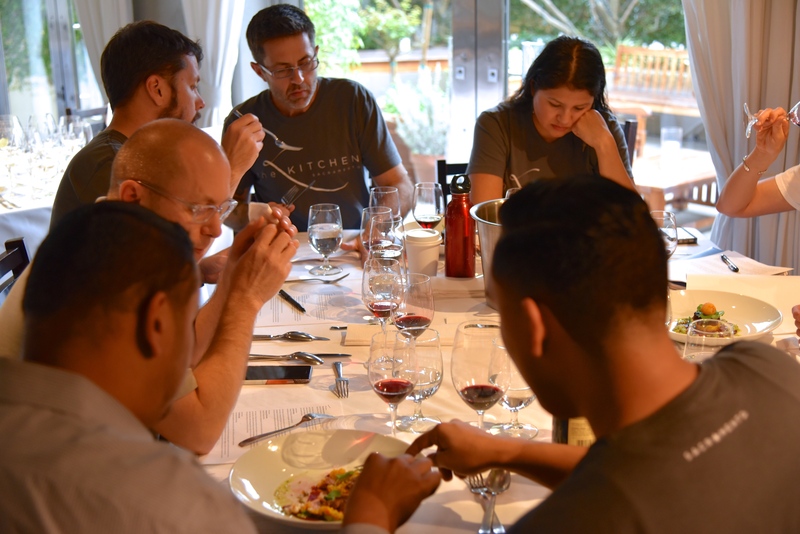 At The Kitchen, our service staff isn’t just knowledgeable about wine. We have a well-curated list of beers, sakes, and rare bourbons, scotches, and whiskeys as well that we love to recommend as pairings or just on their own. 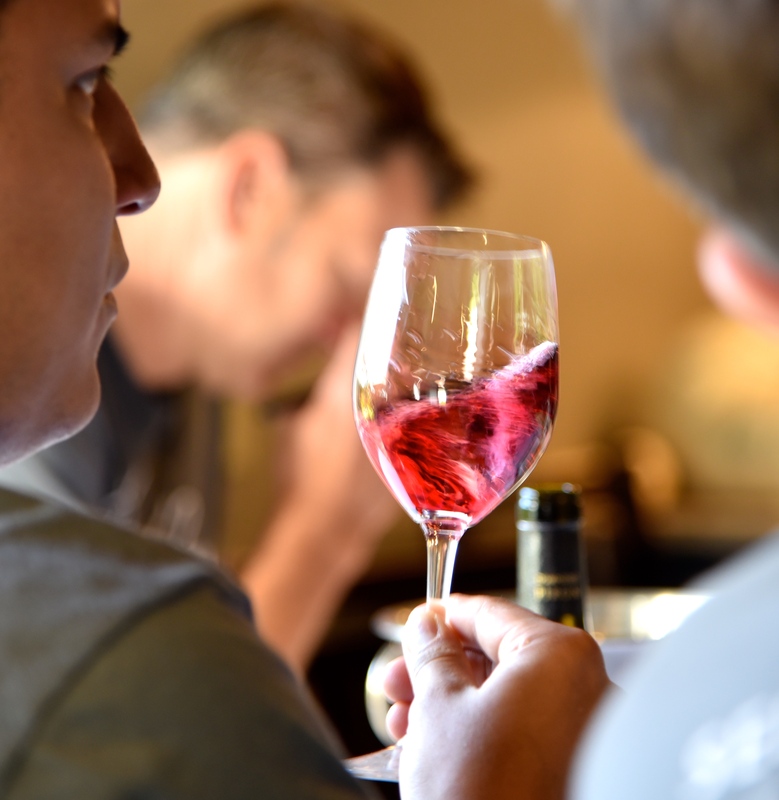 No matter what you are looking for, having Sommeliers and servers on hand who know and love wine is a surefire ways to add to your Kitchen experience. Q: What do you see as the role of the Sommelier? Tesh Diyal: My role as the Sommelier is to connect people to the wine world. We are the bridge that helps open up the world of wine. That is why it is so important to meet the guest at their level of knowledge and then proceed to help build on that. Diego Garcia: The role of the Sommelier is someone who is a professional, welcoming, engaging person who knows the ins and outs of the wine list/beverage list and is there to heighten your experience at the restaurant. Shawn Conway: A sommelier doesn’t just sell and serve wine. A sommelier’s duty is to oversee all aspects of service to our guests. Refilling water, delivering and clearing food, table maintenance, bread service – all of these fit within the job description. Our task is to ensure that all of our guests are met with the highest level of hospitality. Q: What’s the most interesting thing about being a Somm at The Kitchen or a favorite bottle sold or guest interaction? Tesh Diyal: Everything! I love that I get to host a fun dinner party every night and play a role in the guest experience. My favorite bottle sold was not even wine, it was whiskey sold one glass at a time: Macallan M. If I had to pick a bottle of wine I’d say 1991 Caymus Special Selection Cabernet Sauvignon from our 25th Anniversary Collection. My favorite guest interaction is one I get to experience frequently – it’s the look on the face of the guest when they trust your judgment based on information they have given you, and are totally blown away by the wine you recommended. Shawn Conway: The Kitchen is so intrinsically unique. At times service can feel more similar to a house party than a restaurant. Every aspect of working there is unique. I’d say that navigating impromptu dance parties in the dining room during service is up at the top. My favorite interactions always involve helping someone discover a wine they had never heard of, and them being thrilled by it. Recently, I exposed some folks to Madeira, particularly the 1922 Bual by D’Oliviera on our list. The wine is incredible for many reasons – it hails from a subtropical island, was originally developed by traveling on ocean voyages through the tropics, and delivers delightfully complex flavor profile with a range of sweetness levels – citrus, crushed almonds, chocolate, honey. It gives me joy to create a sense of discovery and illumination with beverage. Diego Garcia: Our service is the most interesting thing. I feel like as Sommeliers at The Kitchen we get to be more relaxed then most in our same profession. We engage our guests and want to create a relationship for the next time they come in. My favorite bottle sold is always one that the guest wants to go look for once they leave our restaurant. That makes me feel that I found something special for them. Q: Any tips for the diner in general for how to get the most out of your Sommelier? Tesh Diyal: Trust your Sommelier. We are here to make the experience whole and complete. I very regularly have guest tell me that they are glad they went with a new or different wine pairing because they felt that it really brought the food together. Diego Garcia: Give your Sommelier a couple of examples of wines you drink and what price level you would like to stick with. Trust your Sommelier. This is important. If you give us a free reign within a price level, we have a lot of options open to bring you something you might like. Shawn Conway: Personally, when I go out to eat, I like to give the Sommelier as much creative leeway as possible. I’m out to be taken care of, so why not let someone else take the wheel? This requires some comfort in communicating likes and dislikes, and being open-minded. Pablo Mata at Pujol took my table on a journey through Mexican Bordeaux Blends that I never knew existed and an aged Rioja Blanco that I am still dreaming about. Our table wouldn’t have had those opportunities if we didn’t trust in our Sommelier! We look forward to serving you some great wines – and more! – soon at The Kitchen.